First Friday May 4th, 6-9pm we are tasting Blind. Blind means the wines will be brown-bagged so you don’t know what you’re tasting until after. I ask that you be here for a 6:10pm, 7:10pm or 8:10pm start time as we will taste and reveal the wines in groups. This tasting is $15 per person at the door. No tickets necessary. Brooklyn South cheese and meat boards are available too for $10. Winesmith always serves wine by-the-glass, even during tastings. Cheers! Friday May 11th in the 6-9pm window we are tasting Refreshing White wines: an impressive Austrian Grüner Veltliner, a delicious Alsatian Pinot Blanc, a crisp, floral Spanish Macabeo, a crushable German Elbling, a porch-pounding French Côtes De Gascone and a seafood-friendly Picpoul De Pinet. This tasting is $15/person at the door. No tickets necessary. Brooklyn South cheese & meat boards available too for $10.Winesmith always serves by-the-glass & retail, even during tastings. Cheers! Friday May 18th in the 6-9pm window we are tasting Natural Wines: a delicious, slightly fizzy Chilean Moscatel blend (dry), a savory, rustic Rhone Grenache/Syrah blend, a crowd-pleasing, dry, effervescent Italian Lambrusco, it’s sister Malvasia, an Abillo Real Spanish Orange wine (not made from oranges 😜) and a slightly tart, meaty Spanish Monastrell. This tasting is $15/person at the door. No tickets necessary. Brooklyn South cheese & meat boards available too for $10. Winesmith always serves by-the-glass and retail, even during tastings. Cheers! One of my most popular tastings last summer. Friday May 25th in the 6-9pm window we are tasting Chillable Reds: a lip-smacking Loire Valley Gamay, a crushable Spanish Graciano, a savory, meaty Italian Gaglioppo, a lush French Grenache, a lighter “pizza night” Spanish Grenache and a heady Minervois Syrah blend. This tasting is $15/person at the door. No tickets necessary. Brooklyn South cheese and meat boards are available too for $10. Winesmith always serves by-the-glass and retail, even during tastings. Cheers! First Friday April 6th, 6-9pm we are tasting Blind. Blind means the wines will be brown-bagged so you don’t know what you’re tasting until after. I ask that you be here for a 6:10pm, 7:10pm or 8:10pm start time as we will tste and reveal the wines in groups. This tasting is $15 per person at the door. Must be 21 to attend. Winesmith always serves wine by-the-glass, even during tastings. Friday April 13th in the 6-9pm window we are tasting Spanish varietals other than Tempranillo & Grenache: a meaty, savory Monastrell, a refreshing Macabeo, a white Txakoli, a rosé Txakoli, a heady red Rioja and a Ribeiro blend of Souson, Brancellao, Ferrol & Mencía. This tasting is $15/person at the door. Winesmith always sells wine by the glass, even during tastings. Cheers! Friday April 20th in the 6-9pm window we are tasting my current favorite wines (wines I want to drink) to celebrate my 43rd birthday. Lots of Bubbly, Natural wines, rosé and savory reds. 15-20 amazing wines plus a selection of fine cheeses. Trust me, it’s gonna be sick. $20/person. Tickets available here http://buytickets.at/winesmith/158988 or at the shop. Friday April 27th in the 6-9pm window we are tasing dry rosé: a full-bodied Austrian Lagrein blend, a delicious Tuscan Sangiovese rosé, a classic Provence style, a spritzy Spanish Txakoli, a Chilean sparkling País and an Oregon Pinot Noir Rosé. This tasting is $15/person at the door. Winesmith always serves wine by-the-glass, even during tastings. Cheers! ** There will only be 50 tickets sold for this tasting. The way we always end the year at Winesmith. Friday December 29th, 6-9pm we will be tasting Bubbly: my favorite Champagne of the year, a rich, Frizzante Pignoletto from Italy, an absolutely gorgeous Cremant de Bourgogne, a full, soft Cremant de Limoux, a funky, yeasty Altesse/Molette blend from Seyssel, France and a bright, crisp Spanish Cava. This tasting is $20/person in advance, $25 the day of and includes Dan’s famous cheese board. Get your tickets here http://buytickets.at/winesmith/131634 or in the store. Must be 21 to attend. Winesmith always sells wine retail & by-the-glass, even during tastings. Cheers! Natural wine. Organic. 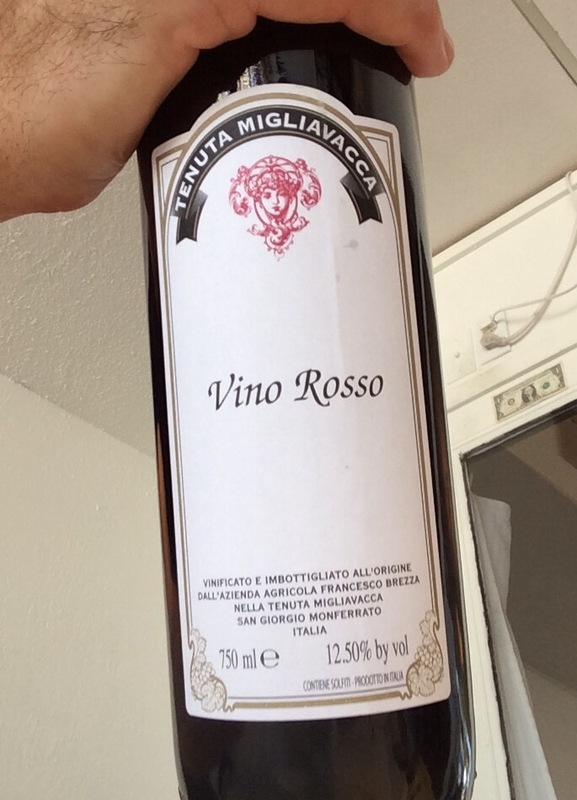 60% Sangiovese, 40% Montepulciano.